Leigh Howard joined the Bison women’s soccer staff in May 2015. Previously, Howard was both a coach and a student-athlete at Trinity College, where she received a bachelor’s degree in psychology in May 2012 and a master’s in American studies in May 2014. 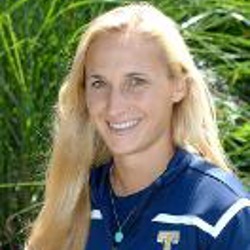 In her second year as an assistant coach at Trinity in 2013, Howard helped lead the team to its best season in program history. The Bantams posted a school-record 13 victories (13-4-1) and won a game in its very first NCAA Tournament appearance. That team was ranked No. 1 in the New England Region for part of the season and finished in the national top-25 for the first time.